Our plan is to put our house up for sale ASAP. 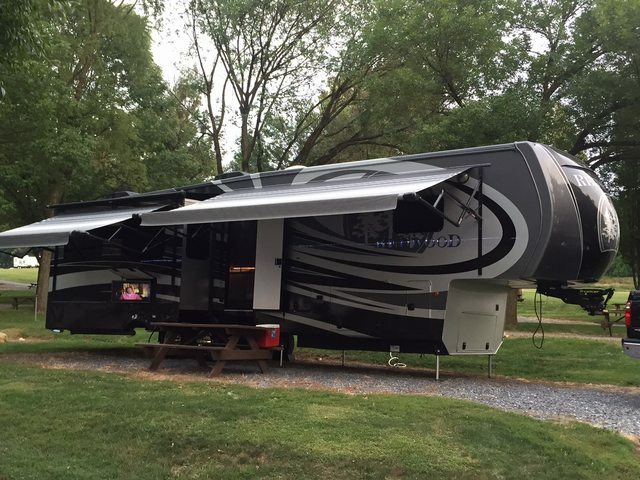 We then plan to live in our RV, taking short weekend trips to get familiar and accustomed to RV living. As soon as the house sells, we plan to go "full-time" and, when my husband retires, travel the US! Any advice/suggestions about RV living and anything else helpful would be greatly appreciated! 1...We currently own a 12 yr old Ford, F250 4x4. Is this vehicle adequate to pull our new Redwood adequately for short distances? 2...What is the best, most economical and quiet propane generator that would support the whole RV for a short amount of time? We look forward to meeting everyone and making new friends on this forum. We also appreciate any input! I am also new to this site....This is great site to get help from really friendly people and they are very helpful and knowledgeable....hope u enjoy it as much as I do...welcome!!! Congrats on the purchase of your new RW. If you haven't already, in addition to this site, I'd recommend an Escapees membership. Because of shear numbers, you'll likely find more info on the Escapees Forum than you ever will on this one, especially since there are such a large number of fulltimers over there. Do you have a gasser or diesel in your Ford? I believe your truck is rated to tow approx. 12K pounds if it's a gasser and 15K if outfitted with the diesel. If you have the gasser, towing your RW would not be recommended. What do you consider a short distance? The 5500 Onan is a well tested genny for your application. You can't go wrong with that choice if you're looking for a hard wired unit. Some folks have gone with the 6500. Congratulations on the new RW & many happy trails in your new lifestyle!! We've been fulltime for 8 1/2 years & the last 4 in our RW & have enjoyed every minute of it. Can't help you with the generator as we don't have/ need one, don't plan to boondock, much too big for most State parks, don't have a residential frig, & don't usually travel far enough daily to get the inside too warm. As far as your F250, the simple answer is NOPE, your best $$ would be spent on a 1 ton dually (DRW) diesel minimum if planning on lots of travel, I know it's a pain driving the dually everywhere, but when towing you'll be glad you have it. Our daily driver for the last 12 years has been a crew can dually, you learn to adjust, most times I can park better/straighter than most of the small cars in the parking lot. What Danny said - as the saying goes, " been there and done that with a single wheel truck". The 38GK is a great coach. However lightweight isn't in the vocabulary. You'll probably be pushing 17k lbs when you load up to go fulltime. Good luck with your new 38GK... I hope you love yours as much as we love our 38RL..
As far as the truck... I have done alot of crazy things in my past, hooking up to a 17K fiver with my 2004 F-250 is NOT one of them... I am a weekend warrior for the foreseeable future and use a 2015 F-350 SRW, and would not go any less. The newer generation trucks are rated to carry much more weight in the bed, those older gen trucks, not so much... After all, it's really all about how much you can carry, not tow.. I would urge you to rethink your towing decision, for your families sake..
Now, lets talk generators, i just had the Onan 6500 LP installed in my Redwood and am very happy with the decision. Just remember that by adding a generator, that will add an additional 300 pounds to an already pin weight. Congratulations on your new rig, and welcome to the Redwood community! The Onan/Cummins generator seems to be the preferred among onboard generators and your RW should be prepped for it. As far as portable generators, I don't really have any experience but Costco has a propane-ready 7000 watt gen for about $700-$800. On your Ford, you will likely be looking at an upgrade because of the weight of your RW. We towed our lighter Montana with a '15 F-250 SRW and it didn't take long to realize it was at its limits for weight. Upgraded to an F-350 DRW and was night and day. When the Redwood joined our family we didn't have to worry about a tow vehicle. Welcome to our Redwood family and congratulations your new RW. We installed an Onan Gold 6.5 KW propane gen and believe that could be a good choice for you. As to the F250 I believe you should consider a F350 dually. The best approach is to search Trailer Life Magazine for their article on sizing the truck to your RV. It involves having your Redwood weighed at a truck stop scale. It sounds involved however it is more about understanding your Redwood's weight and pin weight so you stay within a safe zone for your truck. Happy RV'ing.